Nickelodeon's Spongebob Squarepants hit TV screens on May 1, 1999. Since then Spongebob, along with his pet snail Gary and his best friend Patrick Star, have starred in more than 400 episodes of this popular cartoon. If you've been looking for some type of craft project or creative outlet for your child, then you can't go wrong with a How To Draw Spongebob Step-By-Step Guide. Kids already know all the characters on the show and what kid doesn't like to draw? 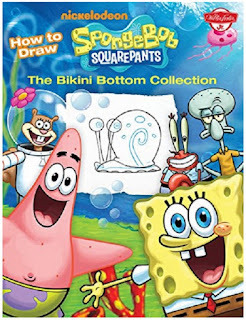 This book will show him step-by-step exactly how to draw his favorite - Spongebob Squarepants. Back Cover Shown Here - Front Cover shown in IntroductionIf your child can hold a pencil, he or she is old enough to follow the steps in this book. Even if they can't read yet, kids can have fun learning how to draw Spongebob Squarepants. This colorful book shows them every single step they need to take. How hard can it be? The guy's a sponge! That's why this is the ideal first "How To Draw" book for kids who want to learn how to draw cartoons. Spongebob is basically just a collection of shapes - circles and squares and rectangles. Put them all together in the right order and Voila! Spongebob Squarepants! Learn to Draw The Best of Nickelodeon: Featuring characters from your favorite TV shows, including SpongeBob SquarePants, The Teenage Mutant Ninja ... and more! (Licensed Learn to Draw)Drawing is fun no matter what your age. At the end of a stressful day it very relaxing to sit down for a few minutes with a pencil and paper and start sketching away. You forget all about what went on at the office. You stop worrying about the kids and their homework, and you just get lost in the simple act of doing something creative. Kids get even more benefits from learning how to draw. First, by following along with the steps in this book, they learn how to follow directions. They also learn what it feels like to try something new, something that forces them to use their imagination and creativity, and they learn what it feels like to accomplish something special. In our home, I have several framed sketches that our son drew when he was really young. My mother even framed a drawing he drew for her when he was still in elementary school. These framed pieces of artwork are cherished treasures to all of us. Don't Forget the Drawing Pads, Pencils and Coloring Pencils! Every kid loves Spongebob. And most adults do, too. What better way to introduce your child to drawing than by giving him a guide to draw his favorite cartoon character! However, don't forget the drawing and coloring pencils. Most children use a regular #2 pencil when they doodle on their homework, but they will enjoy art pencils more. For one thing, they can add color to the sketch. Pro Art 18-Piece Sketch/Draw Pencil Set Strathmore Series 400 Sketch Pads 9 in. x 12 in. - pad of 100 48 Colored Pencils For Coloring Pages and Coloring Books, Bonus Mini Coloring Book included! Get ready for the beautiful, frame-able artwork treasure. How fabulous! You have just solved my 'what to get my grandson for Christmas' problem. He's 7 and absolutely crazy about the Teenage Mutant Ninja Turtles. He also loves to draw. A Learn to Draw book about Ninja Turtles would be just perfect! Thank you! I have it on my Amazon LIST right now! What a wonderful way to keep children's imaginations going. Now I have to get out my coloring pencils and give this tutorial a try. Spongebob is such a fun character. I wasn't aware there was a Spongebob drawing book. This would have been VERY popular at my last office... with the elementary and middle school kids! I'm afraid I've never seen Spongebob, but I know that kids love drawing. I also know that having a creative outlet is helpful for everyone. This sounds like a winner. We can't tear our grandsons away form the television when Spongebob is on. What a great idea for some creative things to do and keep the kids busy.